The heavy-duty Summit Bariatric scale easily accommodates wheelchairs with its large platform size and easy-access ramp. To maximize safety, the scale and ramp are equipped with a non-skid rubber surface and guide rails on the sides. 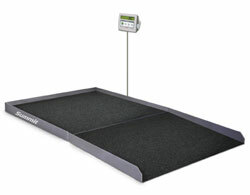 The Summit Bariatric Scale provides exceptional performance in applications where typical wheelchair scales are not large enough to meet the needs of your patients.